Last year, in a year where the first line was arguably the best line in hockey, Smith wound up with 60 points on 22 goals and 38 assists. (He did miss 15 games) If he matches those numbers exactly, he will have had another amazing year. I could see the first line scoring a tad fewer goals this season which would take away some of the assists from Smith. The book appears to be expecting everyone on the first line to progress where conventional wisdom expects them to regress (at least a bit). I expect regression in numbers but continued dominance of play. So, Smith gets an under here but remains one of the most important players on the team, if not the most important. The next two are subject to each other. If Haula plays 82 games with Pacioretty and Stastny, he’ll fly over 48.5 points. Same goes for Tuch. Heck, if the two of them play together on a line, they both may soar past 48.5. However, while I expect Haula to get the first chance on the second line, eventually I think it’ll be Tuch’s spot for the balance of the season. Therefore, Haula will be on a line with guys like Cody Eakin, Ryan Carpenter, Tomas Nosek, and others and will have to generate most of the offense himself. I believe he can generate some, but not 49 points worth if he’s not on the second line. Again, because I expect Tuch to get the eventual call as the second line winger with Stastny and Pacioretty, I think he should have no problem reaching 50 points. If however, Haula does well out of the gate, Tuch’s chance may never come and 50 will look like a huge number for a third line winger. Fleury had 29 wins a year ago and missed almost half the season. Even if he regresses majorly, as long as he’s on the ice he should get to 30 with ease. I could see him hitting 30 before February is over if things go the way they probably should. At this point I still can’t see Subban stealing too many games from him, so as long as there’s not another unfortunate injury, Fleury should be in the net for at least 60 games, if he can’t win half of them, the Golden Knights are in trouble. I’ve got the Golden Knights at 105 points, finishing in 2nd place in the Pacific Divison (1 point behind Arizona, yeah Arizona, if anyone cares). Making the playoffs shouldn’t be too tall of a task for this team, especially playing in the Pacific. LA, Anaheim, and Vancouver should all be out of the playoffs leaving five teams to compete for three guaranteed spots and potentially a fourth with the wild card. 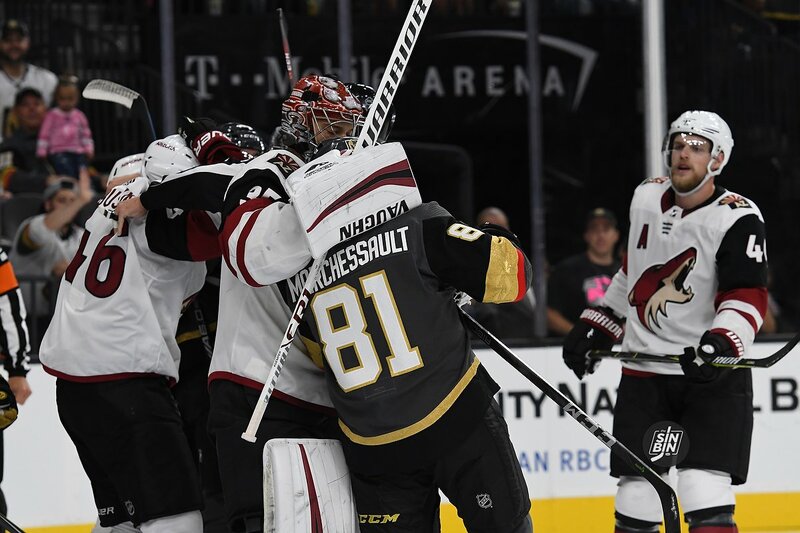 I expect the Golden Knights to once again start the season quickly, but hit a few more rough patches than they did a year ago. Things won’t go quite as swimmingly and it won’t be a “matter of time” before they clinch a playoff berth, but they should be in the playoff picture for a majority of the season. Arizona to win the Pacific. Wow! You might want to put something down on that. . .should get great odds. I have San Jose, Vegas and either Calgary or Anaheim vying for third. I pretty much agree with your assessment. I have Flower at 41 wins if ,of course, he has a fairly (67 games) injury free season. I would bet Arizona at 50 to 1 too.